B-Intruders 2: Circle of Extinction is a free PC game where the player has to shoot several waves of alien enemies, in perfect Space Invaders tradition. 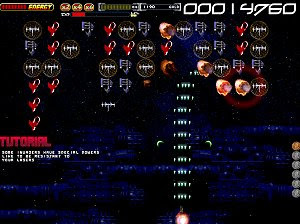 The game features some varied goals, a vast weapon selection, end level bosses and parallax scrolling. Most of all, B-Intruders 2 is a fun and uncomplicated game to play.